Being a part of this 2017 World Maker Faire (held in the New York Hall of Science) has honestly been such a grand experience for the both of us. Just the sheer amount of people who attended the event and came to see our booth was mind blowing, we couldn't have asked for anything more! We were able to meet so many amazing people and received a bountiful of good advice on how to improve our designs as well as being introduced to new technologies, techniques, and approaches! Our booth at the Maker Faire!! To the left is MEOW, and to the right are the MI-Pin and the Peek-a-Plant. In the background, we used a trifold board as a makeshift projector screen to display our YouTube video and the 3D image of the bow that we had hooked a gyroscope to. By the end of the second day, we were exhausted but extremely satisfied by the experience and outcome of this event. We were not expecting to receive so many awards from so many different judges for our MEOW project! 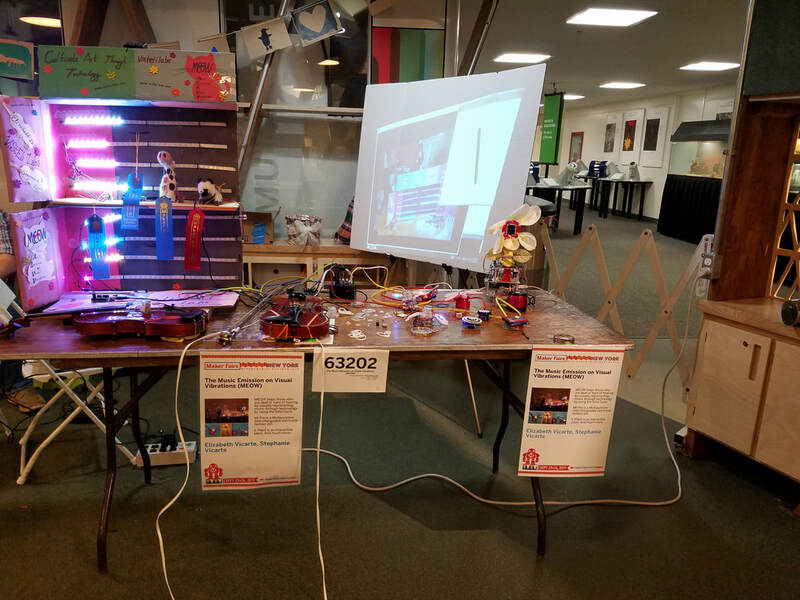 We would just like to say a final thank you to our parents who drove us all the way to New York and for their constant support everyday, a thank you for all the judges who believed we were worthy enough to receive a ribbon, and thank you to everyone who attended the World Maker Faire. We hope this Faire, as well as the Maker community, only continues to grow in abundance and we hope that we were able to inspire the people and the children who came to take a look at our booth to start/continue inventing! We hold a strong belief that every invention holds a valuable purpose to the benefit of humankind, from helping the deaf and hard of hearing, to simply putting a smile on someone's face :-) Never be afraid to create! Thank You!!!!!! During our stay at the World's Maker Faire, we were also able to see many interesting, fun, and fascinating other projects. It amazed us to see the quantity of different makers that each provided an unique experience with each idea and project they presented.